Although the most well-known surrender of the American Civil War happened at Appomattox, Virginia, in April 1865, the largest surrender occurred later that month on the outskirts of Durham, at the house of a yeoman farmer. 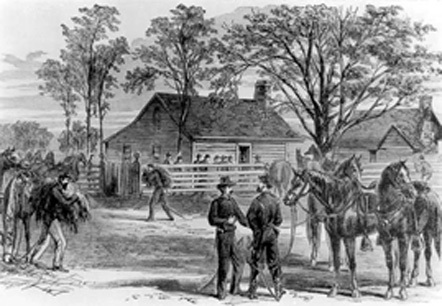 James and Nancy Bennitt’s farmhouse was centrally located between Union General Sherman’s headquarters in Raleigh and Confederate General Joseph Johnston’s in Greensboro. With the surrender at Appomattox a harbinger of the Confederate fate, Jefferson Davis gave Johnston permission to negotiate surrendering the nearly 90,000 troops left in North and South Carolina, Georgia, and Florida. The agreement was finalized on April 26, twelve days after the assassination of Lincoln. Surrenders occurred soon after in Alabama and Louisiana, and the War Between the States was over. We shook hands and introduced our respective attendants. I asked if there was a place convenient where we could be private, and General Johnston said he had passed a small farm-house a short distance back. . . . We soon reached the house of a Mr. Bennitt, dismounted, and left our horses with orderlies on the road. Our officers, on foot, passed into the yard, and General Johnston and I entered the small frame-house. We asked the farmer if we could have the use of his house for a few minutes, and he and his wife withdrew into a smaller log-house, which stood close by. These “”few minutes”” extended into days, by the end of which Bennett Place was already recognized as a place of historical significance. Soldiers carved their initials on the house’s siding and beams, and the Bennitts’ table on which the treaty had been signed was removed upon promise that they would receive ten dollars and a horse in return. The Bennitts never saw a cent of the money, nor hide of the horse, but they did receive a place in history. The war’s end at Bennett Place helped inaugurate a new era for Durham. Durham was neutral ground during the truce, and soldiers from both armies fraternized. The storehouse of J. R. Green’s small tobacco factory was soon emptied of its entire contents, and Green thought he was ruined. When the thousands of soldiers returned to their homes all across the United States, they wrote to Durham’s Station for more tobacco, and Green—and Durham’s—tobacco boom was off and running.